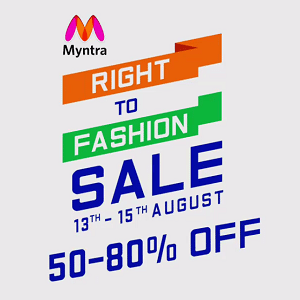 Myntra is Celebrating Independence day by exercsing your Myntra Right to Fashion Sale from the 13th, 14th & 15th August. Whoever said fashion isn’t for everyone? Watch this video of people from different walks of life making their own, unique fashion statements! Never tried shopping online? Did you know, Myntra, India’s Leading Online Fashion Store offers 100% authentic products from over 2000 Indian & International brands with amazing benefits like Great Deals, Easy Returns, Cash On Delivery and Quick Refunds! So, what are you waiting for? Try Myntra, You’ll Love It!! How to Buy Online Products in Myntra Right to Fashion Sale?